Thumbnails tab of Document Options window lets you create thumbnail images for document pages. You may use these images on your web site or in your application for displaying of document page previews. Thumbnails images are created and stored in separate graphic files of either JPEG or PNG format. 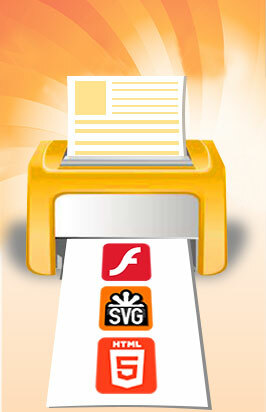 After you convert a document, thumbnails are displayed in the Thumbnails tab of the Print2Flash Application window. For example, string "2-7, 11, 20-" instructs to create thumbnails for pages from 2 to 7, page 11 and pages from page 20 to the end of the document. Thumbnails for page 1, pages from 8 to 10 and from 12 to 19 are not created. Fit to rectangle - thumbnail images are scaled so that they fit a specified rectangle. The image retains original page proportions but is scaled so as to fit this rectangle to maximum extent. You need to type this rectangle dimensions (width and height) expressed in pixels in the edit boxes. See Thumbnails for more information. Page thumbnail format field specifies the image format in which thumbnail files are created: JPEG or PNG. For JPEG format you may also specify JPEG quality similar to JPEG Quality field in the Optimization tab.